The oceanic hub is the Viaduct Harbour area, bustling with cosmopolitan restaurants satisfying every taste, lively bars for late-night celebrations and an expansive marina showcasing an impressive array of motor cruisers, superyachts and sailing boats. 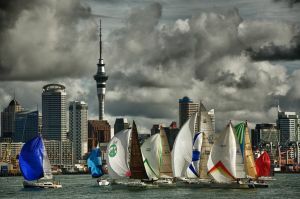 It is from here you can channel your inner racing spirit and take an excursion on original America’s Cup yachts or training vessels with the Explore Group, which specialises in a variety of sailing experiences. This is no lay-back-and-let-the-wind-fly-through-your-hair day, but a full-on immersive experience with all on board expected to work together. Tactics, grinding, strategy and helming are all required; you can even participate in an America's Cup race between teams. Getting involved makes you appreciate just how strong, skilled and brave the America’s Cup contestants are. The deck is littered with potential hazards, you will get wet, but it is exhilarating. If you are bitten by the maritime bug and want to experience the America’s Cup race close-up, chartering an Explore yacht, complete with crew, is an option, but book early. If all that seems too much like hard work, take a relaxing trip to upscale Waiheke Island, one of the most desirable habitations for Auckland’s rich and famous, yet still accessible for the average traveller via regular ferries from the city’s main terminal. Alternatively, make the journey with Auckland Seaplanes. The fly-and-dine trip departs Viaduct Harbour and takes a 35min scenic route in a beautifully-maintained de Havilland Beaver over the Rangitoto Nature Reserve and the volcano on Motutapu Island before landing on the waters of the beautiful half-moon bay, Oneroa Beach. Once you're down, it’s a gentle putter and a short paddle to land. From here, a short walk leads to a superb three-course lunch at the beautiful Cape Cod-styled Oyster Inn. The menu proffers locally-caught fish, New Zealand beef and lamb and a great selection of desserts. It also carries a wine list consisting of predominantly local Waiheke wine. A thriving wine industry has developed in recent years with vineyards such as Man’O War, Mudbrick – which also provides luxury accommodation – and Cable Bay, all offering refreshing whites, rich rosés and robust reds to suit all tastes. Equally impressive are the golden sandy beaches offering the perfect place to take a dip in the ocean or enjoy dramatic waves for surfers. Transport around the island comes in many forms, boat, bus, taxi, bike, or even eScooter. Waiheke moves at its own pace, one that is relaxed and completely bewitching. If the weather is a little rainy, the intelligently laid out Maritime Museum appeals to children and adults alike. The exhibits are enthralling and highlight New Zealand’s close cultural and commercial connection to the sea. Exhibits and activities include life in a lighthouse, pirate language lessons, learning to tie maritime knots, an extensive model ship display, the history of the America's Cup and the firing of an actual ship’s cannon. However, the jewel in the crown is to board a renovated original immigrant ship and see first-hand the cramped quarters and tight conditions many NZ ancestors had to endure. It makes flying Economy Class in commercial aircraft seem like pure luxury. For travellers wanting to immerse themselves completely in the nautical experience, the only place to stay is the Hilton Hotel. Perched at the end of Princess Wharf, the building is designed to replicate the form of a luxurious ship – think Queen Elizabeth II. The external design is easily confused with one of the regular cruise ships that visit the port, while internally it has stylishly emulated the age of the shipping line through clever use of nautical themes. Once on board, guests check-in at a reception lit with ceiling lights shaped like a small flotilla of yachts. Above the reception, stainless steel seagulls act as shades, spreading gentle, warm light. The varying sections of the lobby and bar are divided by knotted ropes mirroring the lines that fix ships and yachts to port bollards, while the sweeping staircase leading to the restaurant – unsurprisingly named FISH – echoes the wide spanning steps on board many of the elegant ladies of the seas. The rooms could well be confused with ships' cabins, but with much larger, clean lines and minimalist furniture. Floor-to-ceiling windows with balconies giving on to views over the harbour deliver an overall impression of light, space and a sense of freedom to discover new experiences and places. 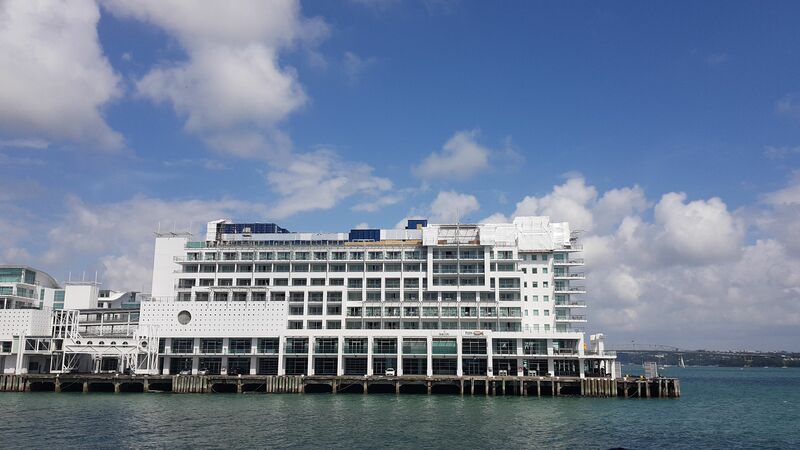 Fittingly, at the end of the neighbouring Queen’s Wharf, guests have a glimpse of an intriguing piece of installation art by Auckland artist Michael Parekowhai. From any angle during low-light hours, the small maritime styled house, which sits incongruously next to large freighter and cruise ships, beams an intriguing set of neon lights through its homely windows. Those that look closely will notice a captive, oversized, literally floor-to-ceiling statue made of polished stainless steel of a pensive Captain Cook. “The Lighthouse” symbolises much, a safe beacon, a leading light, discovery and a city that loves the sea. Jane Stanbury reported with the help of Tim Huppler.